With Legacy Machine Perpetual, MB&F and independent watchmaker Stephen McDonnell have reinvented one of the most complex traditional watchmaking complications: the perpetual calendar. The result is Legacy Machine Perpetual, featuring a visually stunning in-house movement, developed from the ground up to eliminate the drawbacks of conventional perpetual calendars. 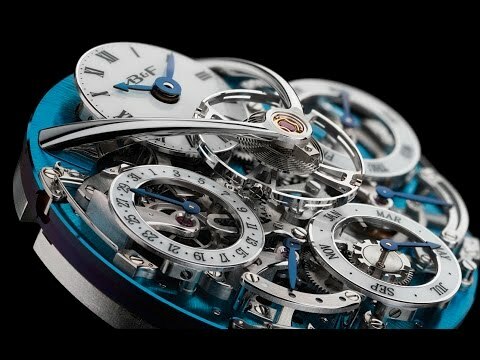 The 581-component, fully integrated and purpose-built movement of Legacy Machine Perpetual has been designed for user-friendly and trouble-free use: thanks to an innovative “mechanical processor” (patent pending), no more skipping dates or jamming gears, and the adjuster pushers automatically deactivate when the calendar changes, so no problems there either. Fully integrated perpetual calendar developed for MB&F by Stephen McDonnell, featuring dial-side complication and mechanical processor system architecture with inbuilt safety mechanism. Manual winding with two mainspring barrels. Bespoke 14mm flying balance wheel visible on top of the movement. Superlative hand finishing throughout respecting 19th century style. The revolutionary mechanical processor uses a default 28-day month and adds extra days as required. There is no "skipping over" redundant days, so the result is a fool-proof system that auto-protects itself from incorrect manipulation. The 14mm balance wheel and indication dials hover above the movement, offering a perfect view into the 581 components of the complex mechanism. Hours, minutes, day, date, month, and leap year can be set independently by manually pressing the correctors. No need for special tools or complicated date setting! The perpetual calendar is one of the great traditional complications, calculating the apparently random complexity of the varying numbers of days in each month − including the 29 days in February during leap years. But traditional perpetual calendars do have a few drawbacks: dates can skip; they are relatively easy to damage if adjusted while the date is changing; and the construction of the complication is usually a compromise consisting of a module powered by a base movement. LM Perpetual fuses these into a single system: the display is in fact an integral part of the mechanism, offering a sense of depth and 3-dimensionality rarely seen before. Legacy Machine Perpetual is available in 5 versions.